You can’t please everybody with one car. That axiom is at the heart of the unique and very successful two-car strategy Lexus has applied in the entry-luxury category. The Lexus ES models focus on flagship-type luxury and comfort with front-wheel drive traction, while the IS models handle the sport/luxury side of things with rear-wheel drive or all-weather drive and available F SPORT performance. 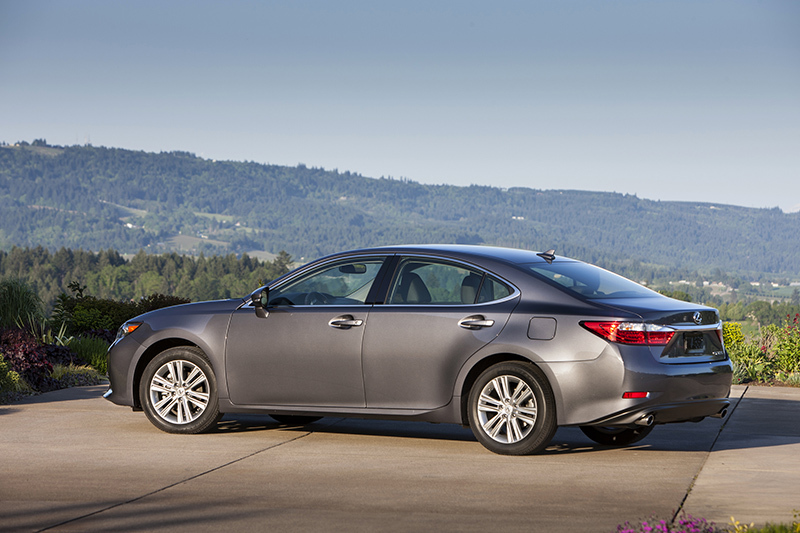 New for 2015, the Lexus ES 350 bolsters its luxury portfolio with newly standard perforated NuLuxe upholstery and Display Audio with a backup camera. Genuine leather-trim is available, as is semi-aniline leather for an even more refined look and feel. Also new for 2015, Lexus has greatly expanded the information and connectivity available in the ES 350, keeping the model ahead of the curve in a fast-moving field. Lexus Enform Remote (subscription required), the latest addition to the Lexus Enform family of connected services, allows the owner to remotely view and control certain vehicle features using a mobile app for iOS and Android devices. Key features include remote door lock/unlock; remote stop/start for the engine and climate control; vehicle finder, guest driver monitor and more. The Lexus Enform App Suite, meanwhile, upgrades to iHeartRadio™ 4.0 and adds Slacker for more music-listening choices. The new standard Display Audio uses a seven-inch touch-screen and also includes HD Radio™, Bluetooth® audio, automatic phone book transfer, a vehicle information display and complimentary traffic and weather data provided via HD Radio. If a favorite song comes on the radio while you’re busy with something else, like waiting at a bank drive-through, use the cache radio feature to pause it for up to 15-minutes and then listen later. The screen can be divided into up to three sections to display functions simultaneously. For example, when the car is equipped with optional navigation, you can view the navigation/map plus audio, compass or other function. The navigation system features 3D map with bird’s eye views. In addition, the navigation system can help you reach your destination sooner with up to date and predictive traffic information, including detour preview, ETA calculation and low-fuel coordination with available fuel stations. 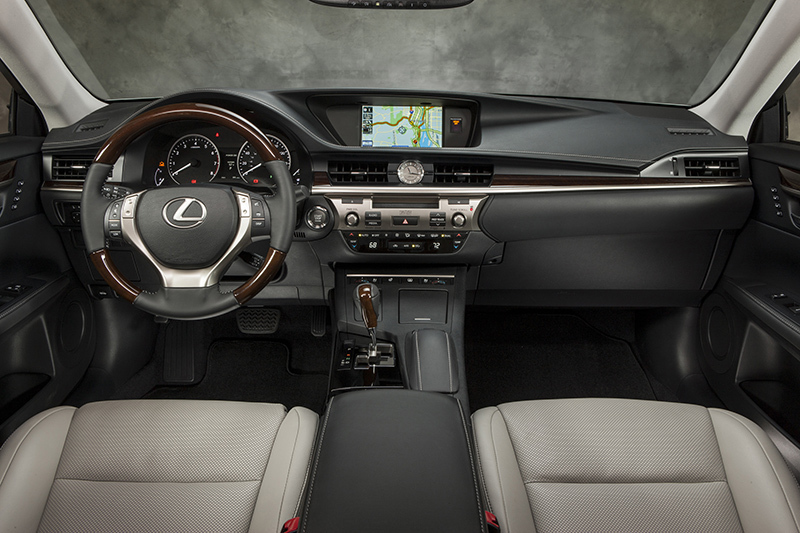 Navigation also includes the Lexus Enform App Suite. Sirii® Eyes Free Mode, which the ES 350 gained for 2014, is compatible with the iPhone® 4S and iPhone 5 models forward and puts select Apple’s Siri technology at your service. Siri lets you call contacts, select and play music from iTunes®, get turn-by-turn navigation through Siri and Apple maps, and much more. The Lexus-signature spindle grille design, flanked by L-themed LED daytime running lights, gives the ES 350 an unmistakable style. The coupe-like profile cheats the wind with a low 0.27 coefficient of drag (Cd), which helps boost fuel efficiency while minimizing wind noise. 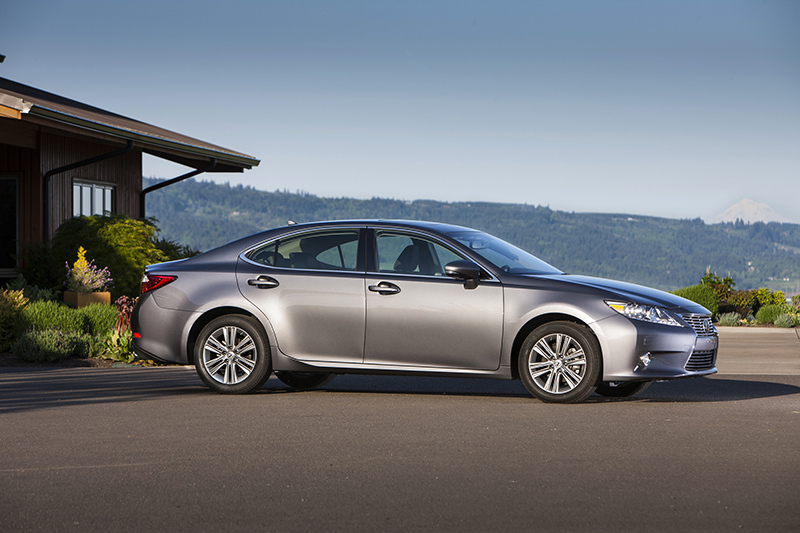 The ES 350 cabin offers 40-inch rear legroom, which is on par with larger luxury sedans. The sweeping roofline does not compromise rear-seat headroom, which is actually one inch greater than the previous-generation design. The ES 350 continues to belie the “entry luxury” label with such standard features as 10-way adjustable power front seats, clear Optitron® gauges, automatic climate control and NuLuxe perforated interior available in parchment, light gray or black. Elegant piano-black trim adorns the instrument panel, doors and upper console, and the ES 350 also offers espresso bird’s eye maple or bamboo trim. With the available 12-way heated/ventilated power front seats, you can extend the seat cushions by 1.4 inches for added leg support. The ES 350 offers exemplary safety features with 10 airbags and an array of available driver aids that includes a Pre-Collision System (PCS) and Lane Departure Alert (LDA). The optional Blind Spot Monitor (BSM) with Rear Cross Traffic Alert (RCTA) helps detect vehicles in side blind spots and can alert the driver to rear cross traffic when backing out of a parking space. The available second-generation Remote Touch Interface (RTI) puts control of numerous vehicle functions at your fingertips. Using the system controller on the center console, you can operate the climate control, audio system, phone, optional navigation system and more. Menus display in the larger center-dashboard screen. Lexus offers additional luxury tiers in the ES 350 via the Premium and Luxury packages, with the Ultra Luxury Package delivering flagship-style amenities. Providing the ES 350’s hallmark silky performance is a 3.5-liter V6 with powering the ES 350 will take car from zero to 60 mph in just 7.1 seconds. The V6’s 248 lb.-ft. of peak torque ensures quick, seamless response in everyday driving. Efficient use of fuel is another key talent of this highly responsive engine. The ES 350’s six-speed automatic transmission also gets much credit for the outstanding combination of performance, efficiency and quiet ride. The ES 350 driver can tailor powertrain response and other settings to suit conditions or the mood. ECO mode adjusts engine response and climate-control settings to help maximize fuel economy. Sport mode sharpens throttle and transmission response for a more engaging driving experience, while Normal mode is designed to provide an ideal balance of performance and efficiency. The supremely quiet Lexus ES 350 sets the stage for the best in automotive audio, another brand tradition. The standard eight-speaker Lexus Premium Sound System plays from a variety of sources, including the in-dash CD player, USB/iPod® connectivity, Bluetooth® audio streaming, HD Radio™ with iTunes® tagging, and an integrated SiriusXM® Satellite Radio receiver with an all-access 90-day trial subscription. With Automatic Sound Levelizer (ASL), there’s no need to adjust the volume when ambient noise increases. As in all Lexus models, the pinnacle of audio performance in the ES 350 comes from the available Mark Levinson® Premium Sound. With 835-watts playing through 15 speakers, this system brings all types of music to life. GreenEdge technology doubles amplifier output while reducing its energy consumption by 50 percent. New for 2015 model year ES, the available Mark Levinson system integrates a new audio restoration technology that was introduced in high-end home systems only recently. The technology restores some of the clarity lost during compression for digital formats commonly used today. The new Clari-Fi technology automatically analyzes compression in the signal of digital tracks (CD, iPod, etc.). It recognizes the level of compression and determines how much amplification is needed, and where, to correct it. The result is a much cleaner sound that is closer to the original recording. The available Lexus Enform service, with Destination Services, and App Suite, can make a compatible smartphone even smarter. Lexus Enform provides access to the subscription-free App Suite. These voice-enabled apps let you search the Internet through Bing™, make restaurant reservations through OpenTable®, get movie tickets via MovieTickets.com™, listen to Internet radio, (including Pandora®, iHeartRadio and Slacker), search business reviews on Yelp®, and check in on Facebook Places™. Lexus Enform Safety Connect, Lexus Enform Remote, and Lexus Enform Destination Services come with one-year trial subscriptions. Lexus Enform Safety Connect is standard on all vehicles, while Lexus Enform Destination Services is on all vehicles equipped with the optional Navigation system. The Lexus Enform response centers operate 24 hours a day, every day. Compared to previous-generation ES 350, suspension changes, a stiffer body and a quicker steering ratio help deliver more precise handling. Front suspension employs opposite-wound coil springs to help enhance straight-line control. Revised rear suspension geometry and improved shock absorber damping characteristics enhance ride comfort. Increased body rigidity achieved through lightweight, high tensile strength steel, added bracing and more spot welds then previous generation models. Airflow is smoothed beneath the vehicle, enhancing driver control and fuel economy. Equipped with standard 215/55R17 low rolling resistance tires on 17-inch alloy wheels or optional high-gloss 17-inch wheels. 18-inch high-gloss alloy wheels are offered. Available Lane Departure Alert (LDA) is packaged with automatic high beam dimming technology. The available Pre-Collision System (PCS) uses sub-millimeter wave radar, designed to detect certain obstructions traveling ahead and prepare the vehicle for a potential collision. The ES features a class-leading 10 airbags as standard equipment, including driver and front passenger knee, driver and front passenger front and seat-mounted side air bags, as well as rear outboard seat-mounted side airbags and front and rear side curtain airbags. Whiplash Injury Lessening (WIL) front seats are designed to limit excessive head movement in certain rear-end collisions, helping to decrease the severity of whiplash-type injuries. 48-month/50,000 mile basic limited warranty with roadside assistance for 48 months/unlimited miles.